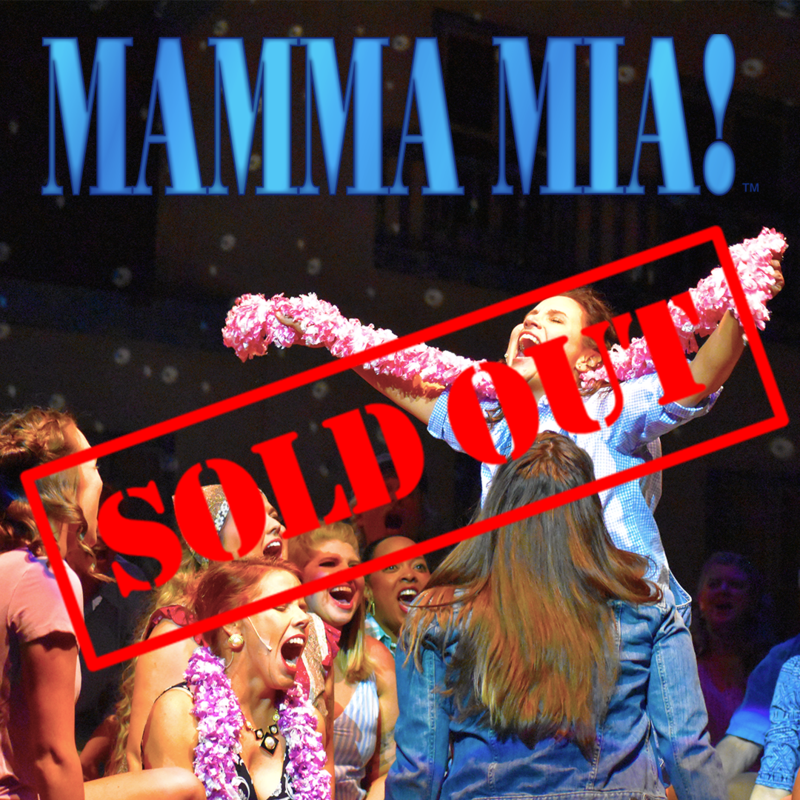 I just finished a 10-show run of Mamma Mia at McIntyre Hall (Mount Vernon, WA) with Theater Arts Guild of Skagit County WA, a nonprofit community theater group. On this show I worked as music director, vocal director, rehearsal pianist and Key1/Conductor. Cutoff on third “Sophie” – hold and fade on any chord. We used the Broadway recording as our guide. Delete these guitar strums in score: m. 8 strum beat 3, m. 10 strum beat 3 and 4.
m. 34 – throughout the score, the pickups written were never clear for the vocalists. I changed all pickups to “& 3& 4” (three eight notes to a quarter note beat four) as an upwards arpeggio of that chord. This change made all entrances clear to vocalists in the ballad-type songs. Cut m. 69-70, dialogue moves fast. m. 88 Sophie whole note – chorus is backstage but needs clear beat for entrance. When Sophie sings the final “C”, I have that be beat 2 in time of next section, then 3-4 as fermata beat before chorus entrance. I would add piano bass notes on beat 3-4 so entrance was in pitch and on time with backstage chorus. Chorus tip – have chorus “smile” through entire song. Really helps lighten the sound for this particular song. I built the chorus sound around the altos belt push on C-B on “my my”. To me the altos pushing through in chest voice to the C is what gives this song it’s power. m. 124 line “age does not wither her” is actually Harry’s line, not Bill. This dialogue really needs to happen on that measures so music and dialogue sets up final Sam line “no she’s still Donna”. m. 30 Key1 – beat 3 and 4 on Broadway recording has piano pickups “Eb F Ab – Eb F Ab”. Only a couple notes but I think it adds a lot to matching the original recordings and giving a clear cue to backstage ensemble chorus. m. 32 Key1 part written as 16th notes. I don’t think this works well. There is a lot of rhythm between the two guitars and drums/percussion. 8th note pulses on Key1 fit the groove very well and also gave chorus a steady pitch reference. Throughout song, helps principals and chorus to get air moving by adding a small “h” to the word “you” on “you can dance”, so in a sense it becomes “Hugh can dance”. Many vocalists don’t open up the sound fully just using the “y” sound on “you”. Vamp first four measures. In performance we only had to repeat first 4 measures one time to cover scene change. m. 60 Male Chorus entrance very easy to get yelly because of their parody choreography. Drill a strong proper town appropriate for a traditional male chorus. m. 133 final measure of song, not written in the score but this chord is held while Dynamos make their way to stage. They group in formation and strike a pose, that pose is cue for a final hit with drums/Key1 organ. MD can take cue from Dynamos or MD can cue dynamos for pose. Intro women’s chorus is such an iconic sound and this part is very exposed. Listen to Broadway soundtrack for enunciation of the “oo” vowel on “blue”, “do” and “you”. There is a slight Swedish influence on the enunciation, it’s not a straight “ooh” vowel. It’s almost like a German umlaut. A small detail but I think it’s major in re-creating the iconic ABBA sound here. Final chord – Dynamos turn and pose. Like intro, MD can take cue from Dynamos or MD can give cue to Dynamos. As Key1 I would play first three measures of Key3 cue to make sure Sophie and musicians were locked into the same groove. Song starts cold so if Sophie and Key3 are not in sync it’s a train wreck. Cut m. 63-64, dialogue moves fast. Add drum lead in and hit to beat 1 of m. 66 so chorus has a clear cue. So you’ve noticed on the Broadway soundtrack there are a lot of processed vocal parts that would need to be triggered. Maybe you’ve paid extra for patch programming that includes these sounds. Maybe you’ve decided to recreate all those patches yourself. Our Mainstage programming did not include these vocal parts and I did not want to allocate the time needed to get all those sounds perfect so we just cut m. 20-49. This keeps the music driving, gets the audience right into Act 2 and it worked really well. Segue to Under Attack for our production was raising of the scrim to begin the Nightmare Scene (Under Attack). Audio setup a GoPro camera and backstage monitor for me to cue chorus, but there was a slight delay, so my cues could not be on the beat. They had a monitor with drums for the beat and my Key1 piano for pitch reference. This song no beat at the top, but it’s very open so this was an instance I could give a direct cue to the chorus for them to enter together. Once Donna starts singing, the chorus follows Donna’s timing for the ballad intro m. 1-10. I would play my chorus patch the measures before chorus entrances so they had a pitch reference backstage. Vamp last measure 69, I would take over the vamp on piano so I could segue smoothly into the top of the next song, SOS. We added a vamp m. 83-86 with a guitar solo to cover time needed for a scene change. In performance we only had to play this 2-3 times. m. 4 add drum fill so Tanya is clear on entrance. Because she has dialogue lines during the opening four measures, and those measures are the same music, it’s easy for Tanya to lose place and come in early or late. At m. 6 beat three on the G minor chord I would confirm with guitarists that we were all together. (In rehearsals, we had an instance where guitars weren’t following vocals, Tanya came in at wrong spot, and everything was off for a bit. This G minor confirmation nod keeps that train on the tracks no matter what happens). We preferred Version 2 at m. 38. Key2 can crank up the B3 organ here during the dance section. m. 80, going into this from the vamp and to chorus entrance is awkward. Very easy for the beat to get turned around because there’s no changing pitch reference. Have drums support with cue for chorus into m. 81.
m. 101 vamp, we repeated this 4x to cover scene change. The Key3 synth part in m. 103 vamp we only played every other time. To my ears, the synth part sounds too canned if it’s played more than two times. (It makes it sound like “something went wrong so we’re repeating). Cut m. 1-4, start at vamp on Harry cue “I’ve been invited”, but only play vamp one time. Go directly through to vamp at m. 10. In performance, we would often only play that last measure vamp two times, with the second time being a pickup. Dialogue really moves here depending on your staging. I let the vocalist take the front section at a slower, more indulgent tempo which worked well with the mother/daughter emotions at this point of the scene. But at m. 9 go into the normal tempo when drums come in. This gives that emotional moment for audience, but keeps the piece from becoming a dirge. m. 40 -47 we cut. Vamp m. 51 cue is written as C2, but Fsus works better with what the guitars are playing. Cue to exit vamp is Donna, after long dialogue, saying “Look at you”. (Dependent on director staging of course). We cut optional cue notes in first four measures. In performance, to my ears, it doesn’t matter if Donna comes in on key for not. The reason is that the emotion is very high and the opening line “I don’t want to talk” can be done in speech-sing, or even if it’s sung in different key it works well with the dynamics of the scene emotions. Donna will quickly have her pitch reference and be on key for the second phrase. Cue before Donna starts singing is Sam “this is about us”. m. 93 I have all instruments hold through fermata, except Key2 strings does slow diminuendo and so does backstage chorus. I like the notes holding, waiting for Donna to come in with “I don’t want to talk”, because then everything cuts out except vocals and a soft piano. Very effective switch of mood. From m. 94-108 I keep everything small and intimate until right before the drums come in at m. 109. This shocking change was very effective with the audience and always produced applause and loud yells of praise in that moment. The idea is to not telegraph the coming build. Vamp added m. 14-17 to cover scene change. Guitar solo. Final measure can be brought it at any time during vamp for tight coverage of the scene change. Rosie has to hear that opening bell from Key2 at the top for a pitch reference. Err on the side of too loud. We discovered this issue the hard way. m. 9 Key3 sets tempo with a time-synced BPM patch. Play low Bb on m. 10 beat 1 and 2 to give backstage chorus pitch and tempo reference. m. 11 Key2 has “take a chance” sample loops. If using without click track then make sure drums and Key1 (you) can here that for tempo lock. Later in song if tempo is too far off then Key2 will have to lay out on the vocal samples. m. 77 Key3 organ interlude. This is the one patch that does not work at all from the RMS Keyboard patches. As Key1 I always have a backup audio out from my keyboard, so if my computer crashes I can just turn up volume on my keyboard’s piano patch and continue on with the show. For this section I turned mainstage volume down and turned on the volume for my keyboard with a pipe organ patch. Because pipe organs can be a little “washy”, I would mouth the counts of m. 85, 87, and 90-91 ritard for the drums and guitar so we were all tight on the beat. At final chord if I had to stall for time because of staging, I would just end on a IV chord (Eb) and if needed stall more to a IVm (Ebm) chord and this always worked to be tight with staging. We omitted the Key3 church organ. Problem was that Key3 wasn’t loud enough on stage for proper pitch reference and timing. It worked much better as an acapella chorus number. My chorus had no problem hitting a strong Gb chord on Wedding Hymn from the previous Bb chord reference at end of “Take a Chance”. I received many comments from audience members that they were shocked at this moment in the show to realize that our musical theater chorus was a “real” choir. m. 5 chorus fermatas. This is to duplicate the feel of the Broadway soundtrack which I like very much: Railroad track break is beat 3-4, “Say” is beat 1-2 and “I” is beat 3-4. All in time but in performance does indeed feel like a fermata break. m. 14 fermata break waiting for Donna. Most effective to have Donna milk this break, looking at wedding guests for their approval, then Donna sings extended “I…” and we’re back into the groove. m. 33 – we made this all women, not just the sub-group. m. 4-7 we made into a Safety Vamp. Sophie has to change out of her wedding dress into camping gear and sometimes she needs a bit longer. I had the acoustic guitar do appropriate fills here. In Performance the most we ever had to repeat this was 3 times. m. 65-end, backstage chorus has no tempo reference, and Sophie will invariably want to ritard the ending of her phrase. I had the chorus keep on a strict tempo with no ritard (supported by me keeping strict time on Key1 chorus patch. The end effect is very beautiful: Sophie ritards by the chorus does not. A really nice blend of layers for the closing of the Mamma Mia story world. Yes, you definitely want to do all the bow music. This is an audience favorite. We opted for the shorter Mamma Mia option. Waterloo – We had cast members go into audience, and put supertitles up on screen for Waterloo lyrics. Both are a common practice for Mamma Mia and both are very effective at sending the audience out of the theater in a state of euphoria.